I am really loving this series! The Unseemly Education of Anne Merchant, book one in the V Trilogy, was so unique and captivating. Read my review here. I was so excited to continue Anne's story in The Wicked Awakening of Anne Merchant. I was expecting another compelling and intense read, and Wiebe did not disappoint. 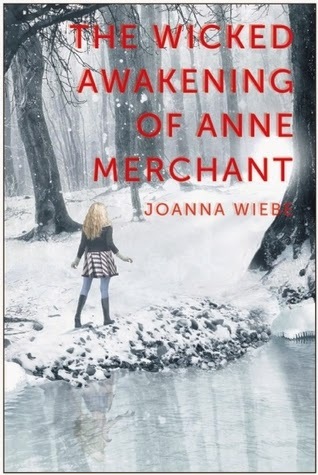 The Wicked Awakening of Anne Merchant was even better than its predecessor. I liked Anne right from the start in book one, and I liked her even more in this installment. She's strong, loyal and clever. Her prosperitus thema, or PT---the unique talent each student possesses that guides their behavior in the race for the Big V---is to look closer. Therefore, Anne takes nothing at face value and is quite tenacious about always trying to get to the truth. I admired that about Anne, as well as the fact that she doesn't scare easily. Anne is a gifted artist, and there was an extra emphasis on her art in this book. I enjoyed her creative process, especially with regards to how she paints the portrait of the school's headmaster. I was impressed at the way Wiebe gave that particular painting had such an important role in the plot. The premise of this series is so unique. I'm not going to tell you what it is, because it'll spoil book one for you, if you haven't read it yet. But suffice it to say, it's imaginative and really fun to read a story this different from others in the genre. Wiebe's pacing was perfect. The book moved quickly, but not so fast that I felt like I was racing to keep up. I had a very difficult time putting this story down once I started reading. It was good from beginning to end, with no slow spots. The Wicked Awakening of Anne Merchant is a compelling read. The slight cliffhanger ending left me aching for book three---and I cannot wait to see how Wiebe concludes this exciting series!